This week's Project Pastry Queen recipe was chosen by Joelen of What's Cooking, Chicago? 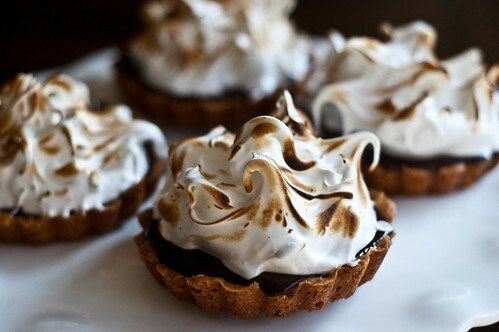 The actual recipe is Texas Big Hairs Chocolate Hazelnut Meringue Tarts. I changed things up quite a bit this week, partly out of necessity. I've been trying to limit my trips to the grocery store, and while I thought I had hazelnuts, it turns out I only had pecans, pistachios, pine nuts, almonds, walnuts, and peanuts. I then realized I didn't have frangelico either, so I subbed Kahlua. And thus, mocha-almond tarts were born. I ran with it at that point, adding instant coffee, almond extract, and more Kahlua to the ganache. I was very pleased with the final product, and I was also really proud of myself. Two years ago, there's no way I would have experimented that much with a baking recipe. Cooking I could do from the hip, but I felt much more rigid while baking. I guess its the scientist in me, not wanting to mess with the chemistry. At this point, I know I can add flavors and textures to things like ganache and still get delicious results. The funny thing was, these tarts look like they should be s'mores tarts, but then you taste coffee. 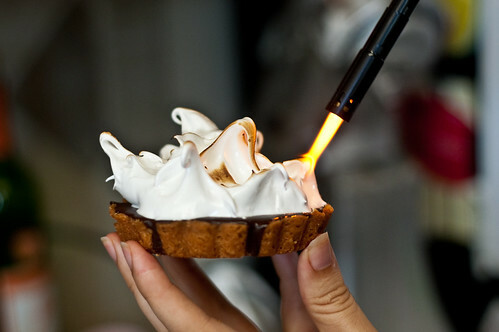 But it did give me the idea to make a s'mores tart! I have to admit, my favorite part of this recipe was the meringue. It was so much fun styling and playing. I'm certainly not much of a hairdresser (Heaven help me when Caroline's hair is long enough to braid), but I had a lot of fun with these. I thought I was making them pretty big and pouffy, but then I saw the picture in the cookbook and realized how small mine seemed - I guess everything really is bigger in Texas. For the original recipe, head over to Joelen's blog. I'm going to post my ganache recipe below, since it is pretty different from the original. And check back next week for jailhouse potato cinnamon rolls - they sound like a perfect tailgating treat to kick off football season! Place the chocolate in a medium bowl. Heat the cream, butter, salt, and instant coffee in a small saucepan until gently boiling. Add the almond extract and Kahlua, and pour over the chocolate. Allow to sit undisturbed for 5 minutes, then whisk until smooth. Looks delicious! 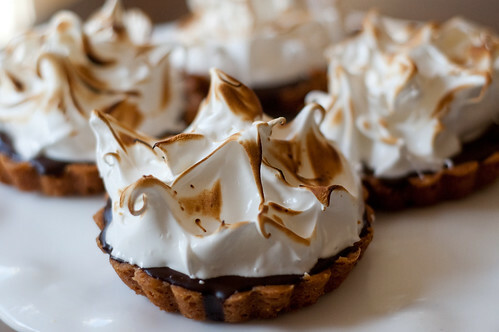 I want to get a torch after seeing your meringue. Look at that swirled meringue! Kudos to you! Looks fab! Looks great! Your flavor combos sound wonderful! Yum!!! I need to get my self a blow torch now!! Looks sooooo good!! I can just say WOW! How did you make the tart shells? What's the recipe?